Oh, yesssss, Harris County has approved spending $105 million to renovate the Astrodome into something called an “event center”! Is that sarcasm? I don’t even know anymore! To recap: The Astros and the Oilers departed the Eighth Wonder of the World a couple of decades back, leaving it empty. Subsequent plans to spend $1.35 billion to turn it into a convention and science center, to spend $400 million to build a sports arena inside it, and to spend $217 million into a convention and event center all failed over the years. So if nothing else, $105 million seems like a more reasonable price tag, though some of that may just be due to anchoring. In exchange for its money, the county will reportedly get the floor of the dome raised up two floors — no, I don’t know how high a “floor” is in dome measurements — which will allow for more parking underneath and reduce seating capacity, presumably. The Houston Livestock Show and Rodeo and the Houston International Boat, Sport and Travel Show are both excited, though if they’re that excited, they could have offered enough in increased rental fees to pay off the $105 million cost, instead of counting on property taxes, hotel taxes, and parking revenues to cover the bill. So I guess if you want a take from me, it’s that while I’m always happy to see old buildings repurposed rather than just demolished, and also happy to see ten-digit price tags come down to nine digits, this still doesn’t seem like exactly a super use of public funds. Too bad they can’t have it serve as a rugby stadium, too — then we’d be talking! Back in November, Harris County voters rejected a plan to spend $217 million on turning the long-vacant Astrodome into a convention and event center. As the Dallas Morning News’ Mark Lamster points out today, though, in one of those Timesian essays with lots of giant graphics that take up your entire browser because this is the future of journalism, dammit, the Astrodome not only hasn’t been demolished, but plans for its renovation are still kicking around. What a great new idea might look like is an open question. Suggestions thus far have included a science museum celebrating Houston’s history as a center of space exploration and oil production, and transformation of the building into an enormous, doughnut-shaped parking garage, a plan that Emmett opposes. The most realistic option remains the one that was already defeated at the polls: a multipurpose venue that might accommodate events such as concerts, conferences and athletic contests. So, the “realistic” option is the really expensive one that voters already rejected, because there’s a powerful politician behind it. Though admittedly a giant parking garage would be significantly dumber. It’s understandable why people would want to retain the Astrodome: It’s historic, it’s kind of a cool building, and it seems a shame not to do something with it. Still, that doesn’t necessarily mean there’s an economically viable reuse for it — old sports stadiums are notoriously difficult to repurpose, given that they’re pretty much only good for sports, and in the U.S. there are a limited number of teams to go around. What’s shaping up here is a race to do something with the dome — the Houston Texans‘ new Reliant Stadium hosts the Super Bowl in 2017, and Emmett says he doesn’t want the Astrodome “sitting like a rusted ship” next door — and arbitrary deadlines way too often end up spawning really dumb decisions. Defeated: Stuart Sternberg’s nemesis Bill Foster is out of a job, as the St. Petersburg mayor was defeated 56-44% by Rick Kriseman, a former city councilmember and state representative. Foster was famously opposed to even discussing letting Sternberg’s Tampa Bay Rays out of their lease on Tropicana Field (though he’d backed down on that a bit of late); Kriseman has promised to “initiate conversations about the future of the team in St. Pete and in this area,” which could mean, um, anything? And he’s also said he’d want to the Rays to pay something for being let out of their lease, though not how much, which is going to be the key element as far as Sternberg is concerned. Suffice to say that the Rays battleground has shifted, anyway. Rejected: A $217 million proposal to renovate the now-vacant Astrodome as a convention and event center was narrowly defeated, 53-47%. The Eighth Wonder of the World and sort-of birthplace of fake grass will now likely be demolished, which is kind of sad as it’s certainly a historic structure; on the other hand, $217 million to remake it as the world’s most ill-advisedly retrofitted convention center would have given new meaning to throwing good money after bad. Elected: Bill Peduto as mayor of Pittsburgh, in a landslide. Peduto had previously come out against the Steelers owners’ demand for $20 million in public money to add more seats, so presumably this makes that less likely to happen now. Elected: Bill de Blasio as mayor of New York City, in an even bigger landslide. De Blasio will need to decide on plans for a new stadium for New York City F.C., as yet still in the formative stages; he’s previously said he’s against tax giveaways, but open to listening on stadium ideas, blah blah blah. It’ll certainly be a change from Mayor Mike Bloomberg, who never met a development project he didn’t like, but de Blasio hasn’t made ending tax subsidies a core part of his campaign or anything. Elected: Betsy Hodges as mayor of Minneapolis, where the Vikings stadium deal still isn’t 100% set in stone, what with the cost overruns and the seat license controversy and all that. Hodges has pledged not to give the Vikings any more money, but given that the 0.5% city sales tax surcharge for the stadium has already been approved and the state now controls the project, it’s frankly doubtful whether her position will end up mattering much. The big one to watch immediately is clearly the St. Pete mayoral situation, given that Sternberg is undoubtedly going to be one of the first to call on Kriseman wishing to start those promised “conversations.” There are still a heck of a lot of obstacles to the Rays getting a new building — how on earth to pay for it, mostly — but Foster, at least, is no longer one of them. With the notion of spending $655 million to renovate the Astrodome and the neighboring Reliant Arena (neither of which have teams to play in them) predictably a non-starter, Harris County sports authority officials are now looking at building an arena inside the dome. Sports Corp. chair Edgardo Colon guesses that this would cost a mere $400 million, though seeing as that no one has decided exactly how this would be done, it has to be considered an especially wild-assed guess. The Reliant Arena needs replacing, say Houston officials, because … okay, I can’t actually find anyone explaining why this is a good idea. The arena has been mostly empty pretty much forever, and though I guess you could argue that it’s the only 8,500-seat facility in Houston (plans for a new arena would keep capacity between 8,000 and 10,000 seats), there isn’t exactly a screaming demand for venues that size. Though Stockton, California, did build a 10,000-seat arena a few years ago, and that city’s been doing … oops. Bill Jackson, the county’s chief budget officer, said such a large bond issue likely would require a tax hike or deep budget cuts, particularly given other projects for which the county will need to sell bonds, such as a forensic sciences facility. If it’s not a surprising conclusion, it is a slightly surprising public declaration, seeing that saying “this will require tax hikes” is akin to saying “this will kill puppies” in terms of public opinion in America today. It’s further evidence in favor of the argument that the plan announced yesterday is more stalking horse than serious proposal, but we’ll see. Incidentally, a clarification on the public cost of the plan: Construction would cost $655 million, but Houston taxpayers would only be on the hook for $523 million, with the rest coming via federal historic preservation tax credits — i.e., non-Houston taxpayers. Since this is a credit that’s available to anyone renovating a historic building (Fenway Park got preservation credits as well) I don’t usually count it as a special subsidy, but it’s arguably still a public cost. So headlines saying this is a $523 million deal or a $655 million deal are both equally right — or equally wrong, if you want to be that way. It took awhile, but Houston finally has a plan for what to do with the Astrodome, which has sat empty since 2006 and is now all wrinkly. The Harris County Sports and Convention Corporation yesterday proposed that voters be asked to approve spending $270 million to convert the dome to a “multipurpose venue” for concerts, football, soccer, and hockey, while replacing the neighboring Reliant Arena with a $385 million exhibit space and 10,000-seat arena. A consultant for Convention Sports & Leisure, which helped the sports authority develop the plan, spoke of how the dome is “an icon to the city of Houston,” but still: $655 million?!? Admittedly, it’s cheaper than the last estimate of redoing the dome, but it still sounds like an awful lot of money to spend for creating a multipurpose venue out of what was always a multipurpose venue, plus replacing an arena that is vacant precisely because there’s already a new arena across town. The Harris County body also included an option to spend $64 million to raze the dome and replace it with a park, and maybe that’s the real goal here: Toss out a crazy-expensive renovation plan, and let voters decide once and for all whether they’d rather throw good money after bad or just cut their losses and demolish the place, iconic or not. 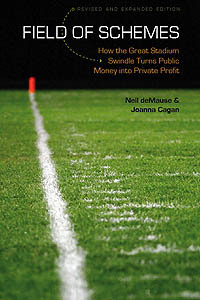 Or maybe we’re just seeing the beginning of a trend of building stadiums and arenas for nobody to play in. Astrodome: To raze or not to raze? A Houston Chronicle opinion piece published today suggests either fixing up Houston’s Astrodome, at considerable expense, or tearing the darned place down. But stopping and staring and thinking about a city’s spirit is not likely to get the cash register ringing to the degree that might be needed to save the place, so Justice opens the floor to democratic alternatives, stating, “If my vision is the wrong one, that’s fine. Let’s hear yours. Let’s work together and come up with a consensus and see if there’s a way to save it.” Generally, when stuff of this nature hits the papers, it is a precursor to demolition, but time will tell. 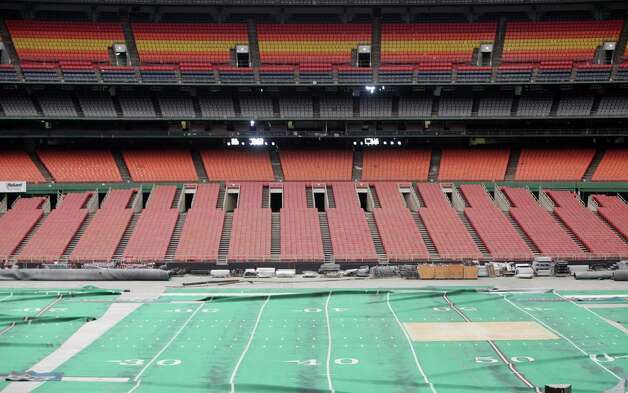 Astrodome reno would cost how much? The stunner is the price tags: $1.35 billion for the full renovation option, and $1.13 billion for the world’s largest storage shed. Even knocking down the dome would carry a high cost: $873 million if you believe the Associated Press, $128 million per the Houston Chronicle, or a mere $88 million if you use the Dallas Morning News numbers — which is still nearly triple what it cost the build the thing in the first place. In any case, given the huge price tags, most of which would come out of public funds, you might think it’d be cheaper and simpler just to let the dome rot in place — right now it only costs Harris County about $2 million a year in insurance and maintenance, plus debt service, but of course the debt would need to be paid off either way. However, Harris County Judge Ed Emmett insists that the dome must go, and fast, apparently because $1 billion is a small price to pay to rid Houston of an iconic-building-turned-eyesore. That’s what they said about the human-mouse hybrids. San Antonio’s Alamodome and Memphis’ Pyramid Arena, both of which were abandoned by their anchor tenants before their 13th birthdays. Or, if a used stadium is too tacky a gift, you could also build your loved one their own for $20 million. It’d be “temporary,” but if there’s any kind of lesson here, it’s that all stadiums are.